HoHoHo Its time to get Crafty. I always grew up just having glass ball ornaments on my tree, while my husband had all different kinds. At first I only wanted the gall ornaments but slowly that changed. I loved see our tree fill up with these unique ornaments. I love making the air dry clay kind with my daughters help. 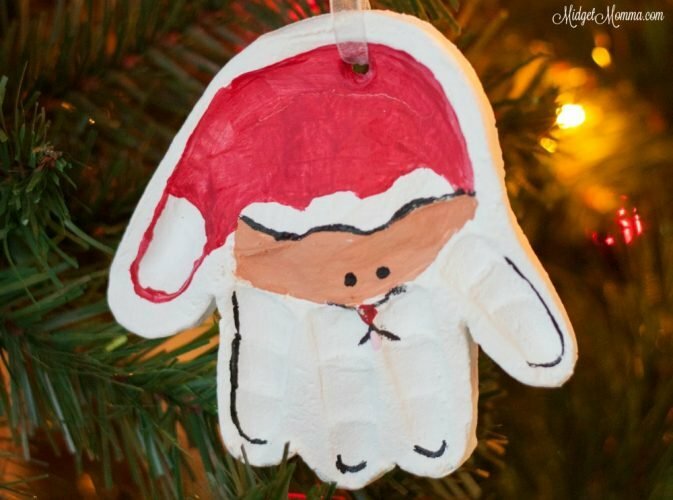 These Handprint Santa Ornament are one of my favorites! They make for awesome grandparent gifts too! Check out other air dry ornaments that are super cute too! Roll out your clay to 1/4 inch. Press your child’s hand into the clay. With a pairing knife carefully cut around the hand print leaving a 1/4 boarder. Make a small hole on the bottom of the hand print which will be your top, to be able to hang it from the tree. Let it dry for 3 days. Paint the ornament white. Paint the Santa hat leaving a small part of the thumb whit for the ball of the hat and a small part of the brim of his hat white. Under the brim of the hat paint it tan for his face, leaving the rest white for his beard. With the paint pen draw his face and highlight around the hand print. Dot a small red dot for his nose.